Last week, we asked you for your nominations for the best sports websites on the Internet. After 20+ nominations were submitted by the community, we selected 7 sites to vie for your vote in being honored as the very best. Without further ado, here are the nominees for the best sports site. 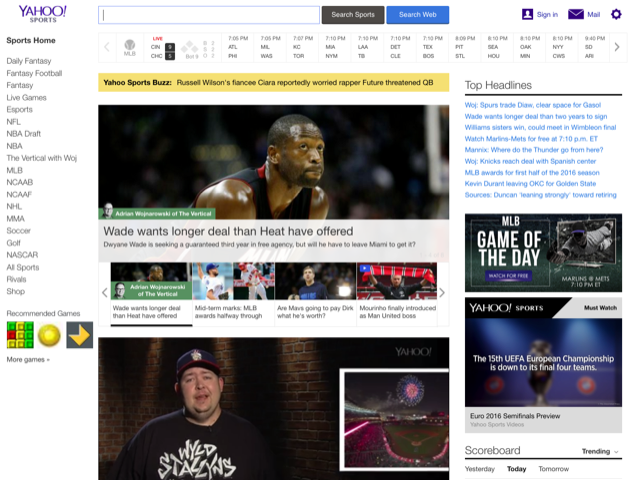 Launched in 1997, Yahoo Sports covers all major sports including the NFL, NBA, MLB, NHL, college sports, golf, soccer, and more. It’s also home to one of the best fantasy sports platforms around the world. Recently, the site has made waves with live streams of a NFL game during the 2015 season and this year’s NBA draft. 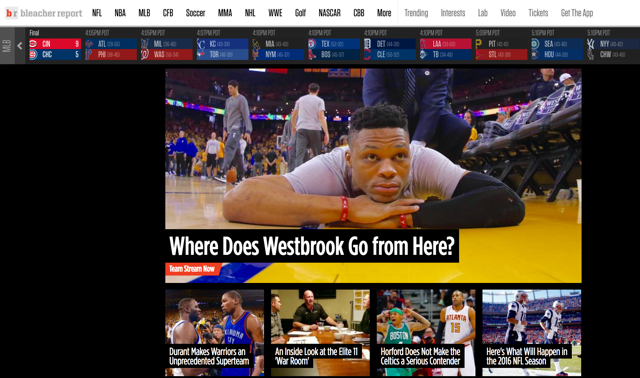 In addition, they recently launched The Vertical, a dedicated sub-site for all things related to the NBA. Launched in 2007, Bleacher Report is one of the fastest growing sports websites today. 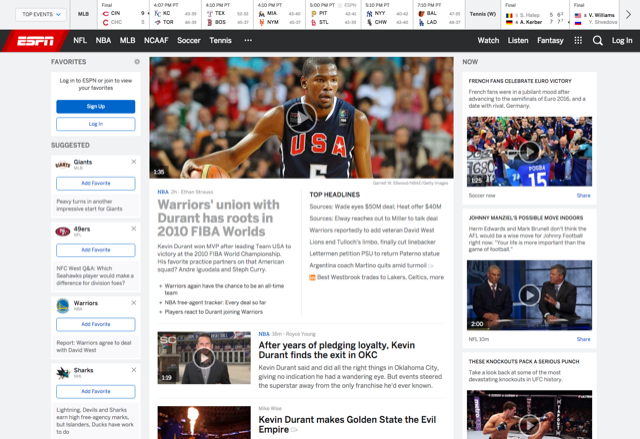 TIME named Bleacher Report one of the top 50 best websites in 2011. The site distinguished themselves early on with its fan-driven sports reporting where anyone could write and publish directly onto their site. Also, if you’re active on social media, it’s almost impossible to avoid Bleacher Report where they provide some of the best live game updates. Pro wrestling fans unite! 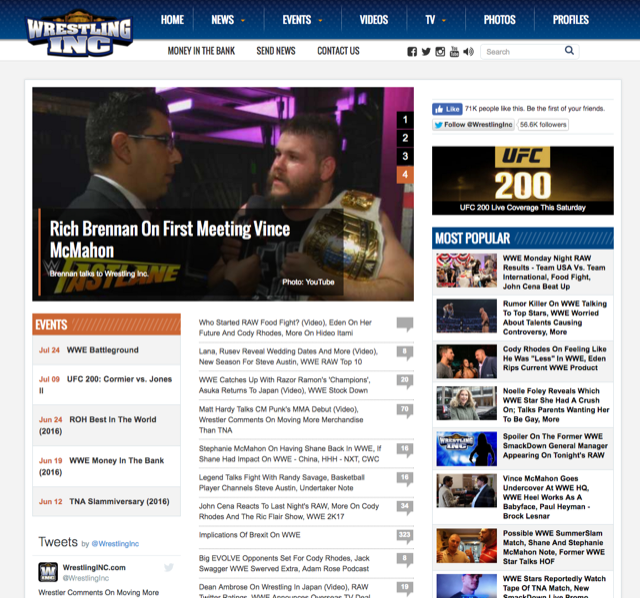 WrestlingInc.com is your source for news on pro wrestling, the WWE and TNA. Stay up-to-date on the latest big matches, follow trending stars like John Cena and Roman Reigns, and watch video and photo highlights. They also have a really active Disqus community that you should check out. 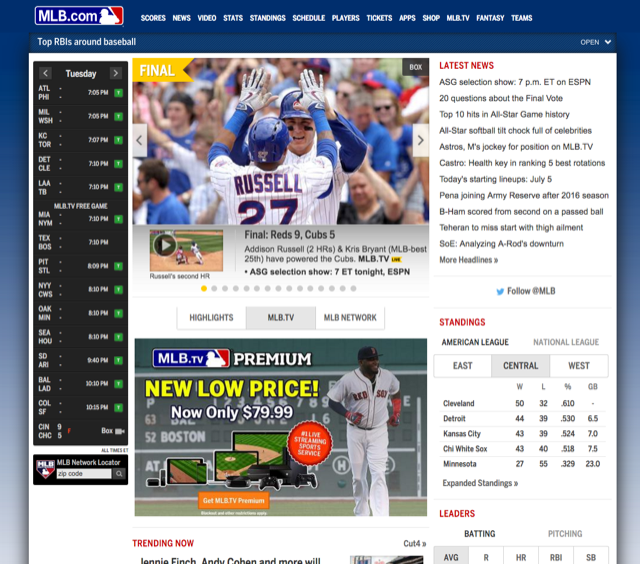 The official site of Major League Baseball, MLB.com gives you all the latest news, video highlights, player statistics, and coverage on all 32 teams as they battle for a chance at October magic. You can also subscribe and stream games from your favorite teams or follow box scores throughout the season. Not to be confused with Bleacher Report, Bleacher Nation is a blog for all the latest Chicago Cubs news, rumors, commentary and analysis. 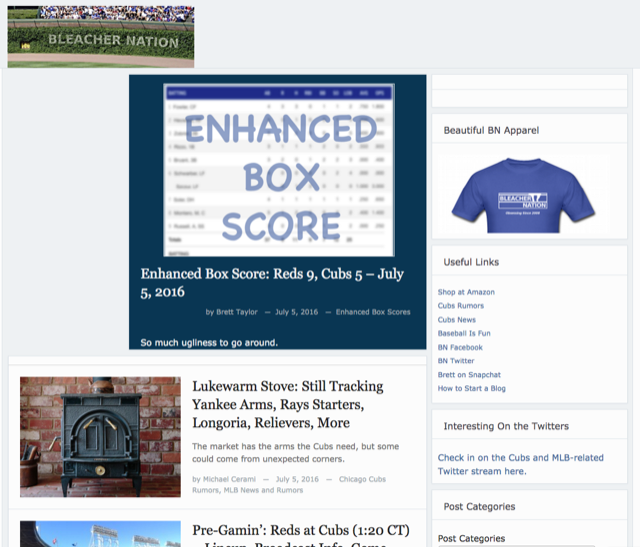 With the team leading their division and owning one of the best records in baseball, Bleacher Nation is a great place for recaps and coverage of each game and upcoming series. A strong World Series contender, the Cubs have a chance to end a century-old drought this season so follow this blog if you’re a fan of the team. 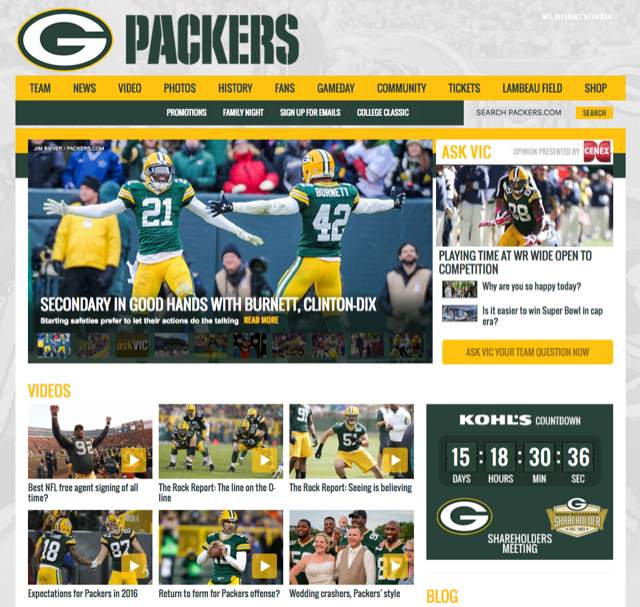 The NFL season opener is approaching and for Green Bay Packers fans, Packers.com is their destination for the latest team updates, news, and stories (plus they use Disqus for comments!). The team is coming off the 2015 season that ended abruptly when the Arizona Cardinals pulled away with the victory in OT. Expect the team to be back looking for revenge and stronger than ever. There’s no other name more synonymous with sports than ESPN. Launched in 1979, ESPN started as a cable television channel for around-the-clock sports coverage and is watched by nearly 90 million households and broadcasting to more than 200 countries around the globe. Its website has live score updates, breaking news coverage, and more. The time to vote has arrived! Cast your ballot below for the sports website you think is the best. Voting will close on Monday, July 11th at 8am PT. The top three sites will be announced shortly thereafter. Want your favorite sites to be recognized as the best sports site on the Internet? Every vote counts of course but it’s up to you to gather the support from other readers to get featured. Good luck to the nominated websites!